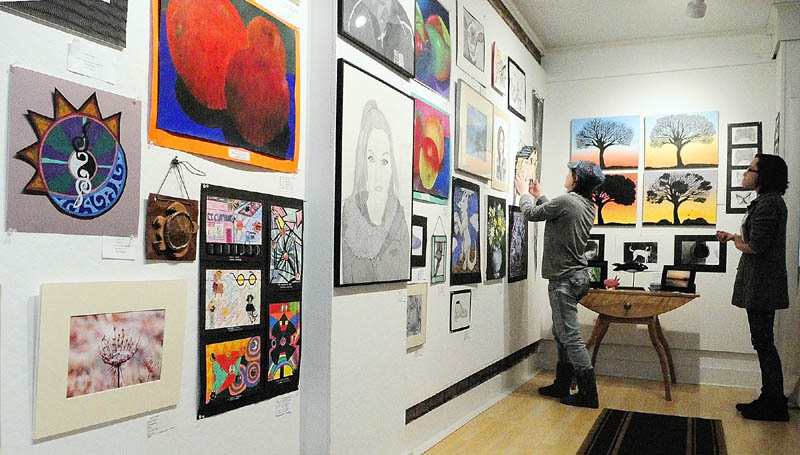 Monmouth Academy students Kayla Frost, left, and Sara Caruso hang an art show Wednesday, with work by students from eight area high schools, at The Harlow Gallery in Hallowell. There will be an opening for the Higher Forms of Art 2013 show this Friday, March 15, from 5 to 8 p.m. The show will hang from March 15 to 30. The gallery is located at 160 Water Street in Hallowell. Schools in the show are Cony, Gardiner, Hall-Dale, Maranacook, Monmouth Academy, Richmond and Winthrop.